Teahupo’o is a village on the southwest coast of Tahiti. Worldwide, though, it’s synonymous with mutant waves, the terrifically terrifying products of the area’s unique geology. A master surfer’s dream recycled, in and out, April through September. To attempt to live out such a dream can be ill advised — five have died since 2000, many more have been violently humbled.1 To attempt to ride this wave on a motorbike is, well, hard to get one’s head around. What do you mean surf on a motorcycle? This spring, Australian FMX legend Robbie Maddison did what he’s been wanting to do for nearly three years: catch some swell on his motorbike. It’s a dream full of childlike wonder, but it comes from a man who’s ridden up — and down from — such heights that land is no longer enough. Whereas a surfer fights to coexist with the earth, Maddison has created the machinery to rule it: He fashioned water skis onto his KTM 250 SX and swapped his back wheel for one with more tread. Maddison doesn’t so much ride the wave as race it. He needs to time the waves right, but he also needs to get in and out before the saltwater compromises his motor. The final product is something many engineers, and even his own mechanic, doubted was possible. Which makes the setting all the more confounding. Had he charged any wave from the seat of his bike, it would have been a novel stunt. But to surf — can you even call it that? 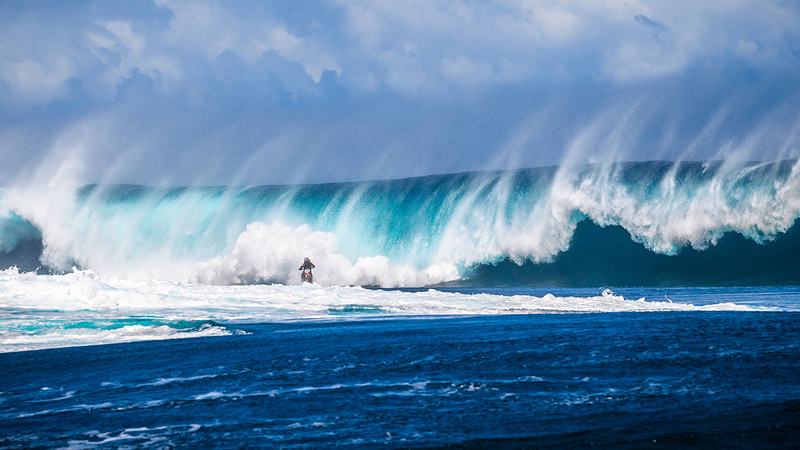 — Teahupo’o is an inspired, and simultaneously informed, choice. And he did — sort of. The video, Robbie Maddison’s Pipe Dream, portrays Maddison as triumphant and unscathed. In the film’s climax, he glides just ahead of a 20-foot wave. It breaks and Maddison is lost in the splash of the thundering curl; he escapes, a conqueror of earth’s gnarliest waters. But life goes on after the cut. What the viewer doesn’t see is that the same wave would ultimately overtake Maddison, sweep him underwater, and knock him unconscious. These sound like the come-to-Jesus words of someone who’s been changed by a near-death experience. But minutes earlier, Maddison had told another story, about how just last week he had flown off the handlebars of his motorbike, hit his head, and, due to latent meningitis, suffered several strokes and a short-lived coma. In the video, however, he does have everything. In fact, the way it’s neatly plotted and cut together to integrate Tahiti’s dazzling natural color spectrum, from rainforest greens to translucent oceanic blues, makes the clip an astounding watch, even if it’s not particularly suspenseful. Like a 007 flick,2 the question isn’t whether our hero is going to live; it’s how he’s going to cheat death. Speaking of which, Maddison did stunt work in Skyfall. The Pipe Dream video suggests that the unthinkable is both possible and epic, but it doesn’t account for the preparation that made it all work. And that’s fine: The montage of Maddison scribbling shapes in his notebook and rubbing his temples belongs to a different film. It’s enough to just watch Maddison glide across the surface of the ocean on 250 pounds of metal and rubber and plastic and let your jaw drop.